Super! Congratulations on your 12th place finish. Congratulations on your top 20 finish, great macro shot! the fact that this photo did not even place in the top ten is proof that people do not look before they vote. This photo was much better than several that finished higher. If this don't ribbon, I'll eat that fly. And congrats on your 12th place! I still love this shot. I think this deserves a ribbon, very sweet shot. Probably one of the most beautiful flies I've seen. Very good DOF on this one. Nice work! Awesome detail. I love the metallic green. Everything about this is factastic, the colours, the clarity, the DOF. Technically flawless and also very interesting to look at. a 10. Wow, that's so crisp !! I love it....great colors. 10 for me !! Great capture. Excellent sharpness and color. Much better than the flys in my portfolio! 10 for this spectacular macro. There were quite a few flies in this challenge, but I think yours was the best. Super crisp detail on this macro. Some amazing color, rich and vibrant. Very nice photo! 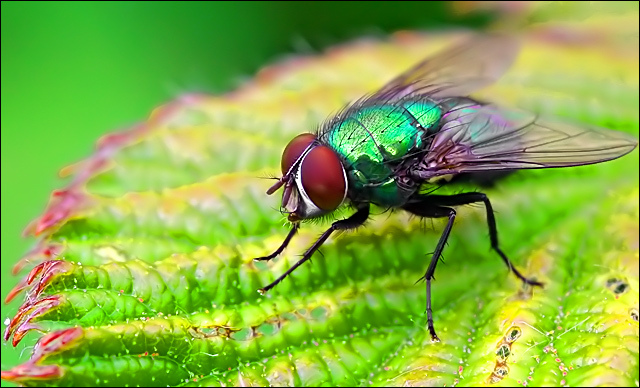 A green fly eh? Rad shot! One of the best macros I've seen this challenge. Best fly shot of the competition. Great job. EXCELLENT macro!!! Love the colours and the detail. Could this be any better? I don't think so.. Good luck! This is a brilliant macro shot. Excellent crisp focus on the fly and fantastic colours. Hope it does well for you. Proudly hosted by Sargasso Networks. Current Server Time: 04/23/2019 03:53:34 PM EDT.